Today's post is the second post that will deal with the tagging used on the 1967-1973 Centennial Issue. Last week, I looked at the Winnipeg Tagging, which began to be replaced in late 1971 and was fully superseded in 1972, by what is known to collectors as General Tagging, or Ottawa Tagging. This is now the standard tagging that is found on nearly all Canadian stamps since that time. However, the process of replacing the Winnipeg tagging with the new Ottawa tagging, was not without its experimentation as well, and it is this experimentation that has led to the existence of additional collectible varieties that go beyond the mere Ottawa Tagging itself. Today's post will be the first of two posts that will explore the tagging that is found on many stamps of this issue. Collectors with even a passing familiarity with this issue will know that there were two basic types of tagging used on this issue: Winnipeg tagging and Ottawa tagging. Today's post will look at the first of these in depth: Winnipeg tagging. The Winnipeg tagging was first introduced in 1962, and so was in use on all printings of the low values from 1967 until 1972 when Ottawa tagging began to replace it. Interestingly, the tagging was not introduced on the high values until December 9, 1969. 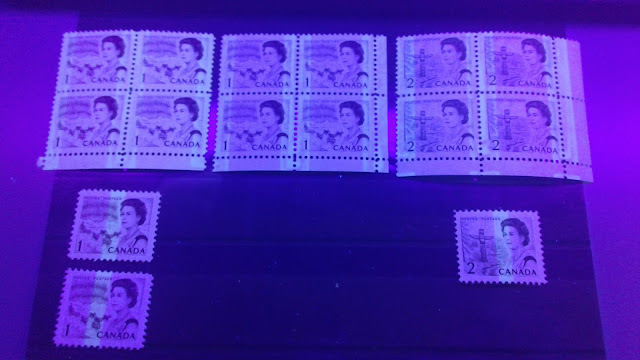 Today's post will complete my discussion of the inks used on this issue as they appear under long-wave ultraviolet light. Last week's post examined up to the 15c Bylot Island. This week, I will look at the 20c through $1 values. 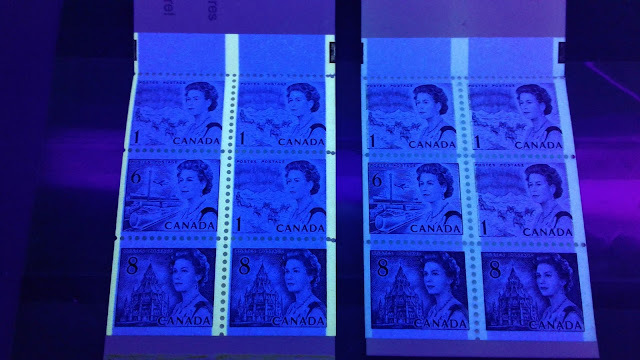 The inks used to print this stamp are primarily non-transformative in that in most cases, the appearance of the colour under UV light is either the same as, or just a bit darker than how the colour appears under normal light. There are however, some cases in which the ink loses much of the blue and becomes either a very deep blue-black, or black under the UV light. These inks are transformative.